“Every kid has a bike but me,” says our sorrowful young narrator, who longingly watches his friends having the fun he is denied. 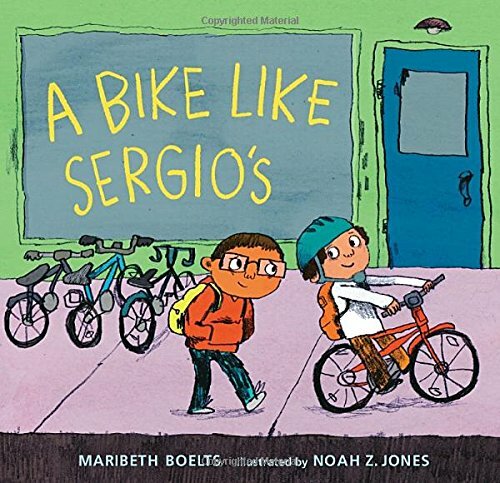 Ruben especially dreams of having a bike just like that of his oblivious friend, Sergio, who rides his new one while Ruben breathlessly runs alongside. But since he’s poor, he says, “I know that wishes won’t make money appear.” At the grocery store, while Sergio purchases a pack of football cards, Ruben buys only the loaf of bread his mom wants. When he sees that the woman in a blue coat ahead of him in line has dropped what he thinks is “just” a $1 bill, he pockets it, and when he gets home, Ruben discovers that it’s really a $100 bill. He dreams of finally being able to purchase a bike, but there’s a decision he must make. This moral and ethical dilemma takes up most of the story. When Ruben thinks that he may have lost the $100 bill, he retraces his steps “from school to bike shop to home.” It’s raining, and “rain and tears feel the same.” This defining moment before he recovers the money lends him a measure of empathy, and finally, young Ruben decides to return the money to the woman who had dropped it. But still, he doubts his choice: “I am happy and mixed up, full and empty, with what’s right and what’s gone.” Ruben is poor, then rich, then poor again. This narrative, for all young readers to digest, implies that Ruben and other children in his low-income community are instinctively drawn to thievery in order to gain material objects. Jones’ digitally assembled watercolor-and-pencil illustrations, with ethnically ambiguous characters, complement the ethnically ambiguous story. All we know is that most of the characters are some kind of brown-tinted, and someone in Ruben’s family may be some kind of white, as hinted by the tiny framed picture on Ruben’s family’s wall of a group of white people. What’s centered here, in text and illustration, is poverty. The “bike like Sergio’s” symbolizes all that Ruben doesn’t have. Rather, what he has is a scuffed-up apartment with lock and chain on the door, a sink full of unwashed dishes, items thrown around, drawers left open, and a mother who’s apparently too busy with four children to teach any of them how to put away their stuff. The neighborhood is scuffed-up as well, but Ruben’s beautiful (and ethnically mixed) classroom is well furnished and spotless. And the math class is working on—let’s hammer the point home in case nobody gets it—problems involving money. Even though Ruben’s dad has a job that requires him to wear a suit and tie, mom crosses items off her grocery list because this week, apparently, they can afford only a loaf of bread and a quart of orange juice until Saturday. And Ruben dreams of—having a bike just like those of his friends. The story is a first-person narrative. So why does the title center the name of a material object (“a bike”) belonging to a minor character (“Sergio”), while disappearing the name of the narrator? Can this have something to do with the agency—or lack of it—of a child of color? Rubén and Mamá and younger sibs go to the bodega to buy some masa and a bag of oranges. While Mamá’s back is turned, Rubén sees some bills fall out of Sra. Rodríguez’s purse. He picks up the bills and runs over to return them to her. Sra. Rodríguez gives Rubén una sonrisa y un abrazo and says, “¡Ay, Diós te bendiga, mijito!” Rubén, excited and happy, runs over to Mamá and tells her what has occurred. She gives him una sonrisa y un abrazo and says, “Estoy orgulloso de ti.” They all go home and, when Papá returns from work, Rubén tells him the story and receives una sonrisa y un abrazo. When Rubén goes to bed, he counts all the sonrisas y abrazos he has received this day. When Rubén comes home from school, Mamá asks him to go to the bodega and buy some masa and a bag of oranges. Outside the bodega, Rubén sees that a woman in a blue coat has dropped her purse. She picks it up, but she doesn’t notice that some money has fallen out. Rubén picks up five $20 bills and turns around to give them back to the woman, but she has gone! Rubén goes home with the money and tells Mamá what happened. Rubén and Mamá, with baby Elena in tow, return to the bodega and ask Sr. Martínez if he had seen a woman in a blue coat a little while ago. Sr. Martínez says that, yes, Sra. Rodríguez was just here and she lives somewhere on the next block. Mamá and Rubén (and baby Elena) start knocking on doors. Finally they find Sra. Rodriguez, and Rubén returns her money. Sra. Rodriguez is surprised and happy. She gives Rubén un gran abrazo and says, “¡Ay, Diós te bendiga, mijito!” And Rubén and Mamá and Elena soon find out that Sra. Rodriguez is about to take some fresh-baked cookies out of the oven…. No grinding poverty and no pining for something that’s unobtainable. No pretending that stolen money is found money. No contrived moral and ethical dilemmas and no sociopolitical metaphors about being poor and then rich and then poor again. A Bike Like Sergio’s is not recommended. Thank you for this review. One can't help but wonder if it had been written by an author named Maria Gonsalves whether your review would have been as negative. This sounds like a well designed and illustrated story about the kinds of moral dilemmas that all children face at some point in their lives. The story would work as well if the characters had Laotian, Armenian, Russian, or Canadian names. And not to acknowledge sadness at what might have been is to deny a very real human emotion. Anonymous, I believe that those of us who produce children’s books have an obligation not to feed our children “pretty little lies” that will ultimately poison them. And those of us who are educators and reviewers have an obligation to call them out when we encounter them. Whether these issues of sadness and wrestling with integrity are valid or not - and I agree this book is great for those points, the makers shouldn't have coded Ruben as Latino. It's irresponsible for makers to play into stereotypes - whether they knew about it or not. This is the danger of having white makers depict characters of color, and another reason why they should step aside and offer makers of color more bookshelf space (and publishing access) - because we're always going to miss something when we're talking about the experience of a community we oppress. I think you are right, Bev. There is a book I read once, called How to Steal a Dog, by Barbara O'Connor. Unlike what you suggested, it does have a poor protagonist who commits a crime. But she decides to steal a dog NOT in order to buy some little thing like a bike, but rather so that her *whole family* can afford to buy a new house with the reward money (since her father, who I believe was the primary moneymaker and was also abusive, abandoned them and left them with so little money that they could no longer afford to pay rent). See? A much more worthwhile "unobtainable". And the characters in that book are clearly white, so readers aren't going to see nonwhites as prone to criminality. I know that's not what you were originally thinking of when you thought of ways to improve the book you reviewed. But I believe that book was a misguided and poorly-researched attempt by its author to try to write a book similar to How to Steal a Dog. That is what its plot reminded me of, anyway. People should know that they just can't replace white characters with characters of color if those characters are villains, simply misguided, or feel they have to take "drastic measures" that are typically seen as crimes. Wow, Sam! Just read the first two chapters of HOW TO STEAL A DOG. O'Connor's book is indeed somewhat similar to SERGIO, except that it's way better written and doesn't trigger the people-of-color-as-prone-to-criminality trope. Seems like the author of SERGIO was trying for something "multicultural" and way missed the point. Thanks for your comment! Noooo! These are all such a frustratingly good points! Makes this book way more problematic than I had hoped and exposes my own ignorance. I use this book to expose my readers to the frustrations of dealing with more privileged peers, to validate the experiences of my kids when they want to act selfishly but must choose to do the right thing, and to teach wealthier readers what it's like to have less. AND I'm always searching for books normalizing multiracial families, and was so excited to see us represented. BUT this entire post is full of fantastic and insightful points - and not having known about the tighter-knit Latino community, I was ignorant to the whitewashing in this book. As a multiracial (white/asian) kid who grew up poor (and my house WAS messy like that because my mom and I were overworked and tired) - I found this story validating, and saw the family reflected as closer to mine (perhaps South Asian, to counter the stereotype that all Asians are rich), not Latino. But I now see that the makers made a huge mistake in ambiguously coding Ruben as Latino. Thank you so much for this insightful resource, I'll be pointing my readers this way.